Astigmatism is a very common vision condition. An abnormally shaped cornea or lens causes it. As a result, light is not projected on the retina, as it should be, causing vision to be blurred or distorted. Astigmatism can affect near and distant vision, or both. The condition is treated with glasses, certain soft contact lenses, or LASIK surgery. Your eyes and brain work together in an amazing process that produces a 3D image of your environment. The process begins when light rays enter the front of your eye and are interpreted by your brain as images. Light rays first enter your eye through the cornea, the “window” of your eye. The cornea is a clear dome that helps your eyes focus. The anterior chamber is located behind the cornea and in front of the iris. The anterior chamber is filled with aqueous humor, a fluid that maintains eye pressure, nourishes the eye, and keeps it healthy. The iris is the colored part of your eye. Eye color varies from person to person and includes shades of blue, green, brown, and hazel. The iris contains two sets of muscles. The muscles work to make the pupil of your eye larger or smaller. The pupil is the black circle in the center of your iris. It changes size to allow more or less light to enter your eye. Your inner eye or the space between the posterior chamber behind the lens and the retina is the vitreous body. It is filled with vitreous humor. Vitreous humor is a clear gel substance that gives the eye its shape. Light rays pass through the vitreous humor on their way from the lens to the retina. The retina is a thin tissue layer that contains millions of nerve cells. The nerve cells are sensitive to light. Cones and rods are specialized receptor cells. Cones are specialized for color vision and detailed vision, such as for reading or identifying distant objects. Cones work best with bright light. The greatest concentration of cones is found in the macula and fovea at the center of the retina. The macula is the center of visual acuity. The fovea is the site of sharpest visual acuity. Rods are present throughout the rest of the retina. The receptor cells in the retina send nerve messages about what you see to the optic nerve. The optic nerves extend from the back of each eye and join together in the brain at the optic chiasm. The optic chiasm is the place where the optic nerves from the right and left eye meet and cross one another. From the optic chiasm, the nerve signals travel along two optic tracts in the brain to the lateral geniculate bodies, and then to the occipital cortex of the brain. The exact cause of astigmatism is unknown. The condition is usually present at birth. Astigmatism results when the cornea, lens, or both has an abnormal curve. With astigmatism, the cornea is shaped like a football instead of a round ball. Astigmatism distorts light and causes a blurred image on the retina. It makes images appear out-of-focus. It may be difficult to see fine details close-up, at a distance, or both. Astigmatism frequently occurs with nearsightedness or farsightedness. Astigmatism usually affects both eyes to some degree. Your near, distant, or both near and far vision may be blurred or distorted. You may experience eyestrain. 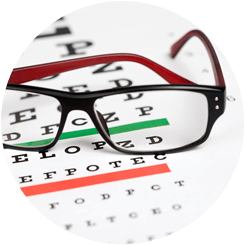 Your doctor can diagnose astigmatism with a general eye exam. Visual acuity testing involves reading letters or numbers from a chart to determine your ability to see near and far distances. Refraction is used to determine the degree of the refractive error. 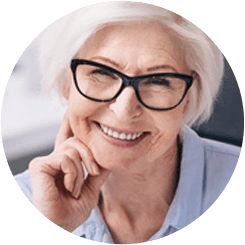 This may be accomplished automatically with an autorefractor or manually, a process in which you indicate which of two lens choices appear clearer or better. The information is used to write a prescription for glasses. Your eye examination may also include slit-lamp testing, in which your doctor uses a slit light and a microscope to view your inner eye structures. Your eyes may be tested for glaucoma with tonometry. Tonometry measures the pressure in your eyes. Astigmatism can be corrected with prescription glasses or hard contact lenses. Standard soft contact lenses do not correct astigmatism, but toric lenses, a type of soft contact lens, can be helpful. LASIK surgery offers an alternative to wearing glasses or contact lenses. LASIK surgery is used to reshape the cornea to correct the astigmatism. LASIK surgery is a short relatively painless procedure that is associated with a quick recovery time.